This gorgeous salad can be made using any citrus you have on hand. I particularly like using blood oranges for their vibrant pop of color but ruby red grapefruit works well also. Likewise you can use any greens that you like, baby spinach, mesclun mix, arugula, or romaine all work equally well. I believe that recipes are merely a guideline to offer inspiration. I always encourage my readers to adapt any or all of my recipes to make them pleasing to their palates and using ingredients already on hand. That's what I do with the recipes I share. Most of the time I gather my inspiration from other bloggers, magazines, websites, cookbooks, family and friends. Then I tweak and substitute and use my own prep and cooking techniques. I adapted this recipe from one found in Bon Appetit. It is colorful, delicious and the perfect start for your Holiday gathering. The recipe as written only serves 4 but can, of course, be adapted to feed as many as you are blessed to have joining you. Whisk together the vinegar, mustard, citrus zest, honey, olive oil, salt and pepper. Set aside. Place the beets on a large sheet of heavy duty aluminum foil. Drizzle with 1 T. of olive oil and sprinkle with salt and pepper. Fold the foil into a packet around the beets and place into a preheated 400* oven for about an hour and a half. Until tender and easily pierced with a fork. Open foil and let cool to the touch. Remove the skins (they should slip right off), and cut each beet into wedges. Set aside. Toss the greens with a couple of Tablespoons of the vinaigrette and place them on a platter. 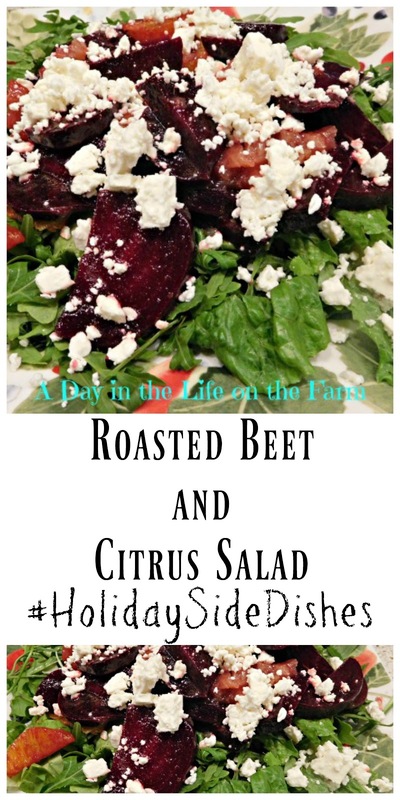 Toss the beets and citrus with another couple of Tablespoons of the dressing and arrange on top of the greens. Sprinkle with the cheese and serve. Adapted from a recipe found in Bon Appetit. I love blood oranges in salads. So pretty. I wish they were available all year long! Nice blend of flavors going on here!